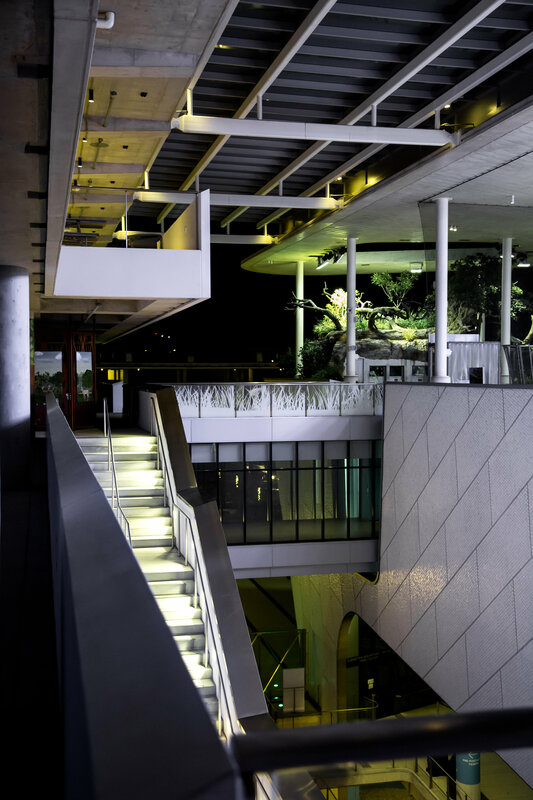 The Phillip and Patricia Frost Museum of Sciences opened doors to its new complex in Downtown Miami’s Museum Park in May of 2017. Designed by Grimshaw Architects, the 250,000 square foot facility combines a planetarium, aquarium, and science museum on one campus. Frost Science is dedicated to sharing the power of science, sparking wonder and investigation, and fueling innovation for the future. At the center of the museum lies the 100-foot wide, 500,000-gallon cone-shaped Gulf Stream Aquarium that spans three levels. The corner-less design allows marine species to swim continuously as they would in the actual Gulf Steam. 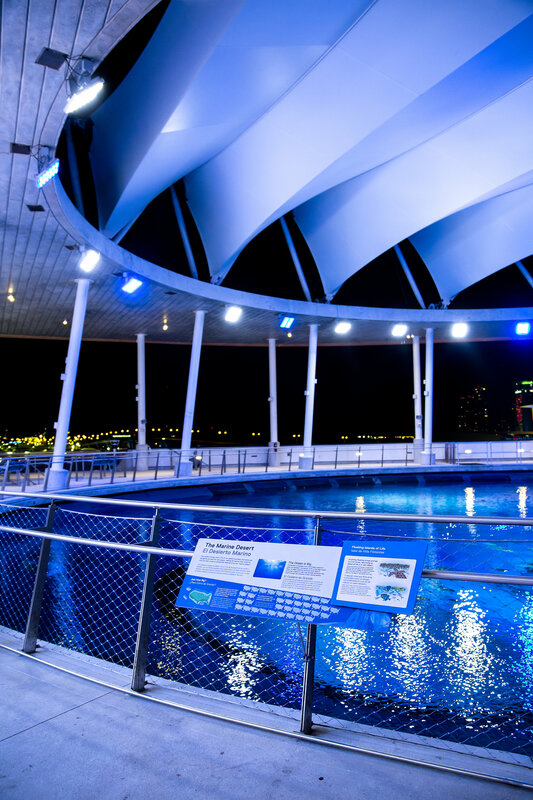 The crown jewel of the aquarium is the Oculus Lens - a 31-foot wide, 13.5-inch thick lens – a massive viewing portal located at the bottom of the aquarium. The lens, offset at 21-degree angle, gives guests wall-less views into the aquatic exhibit above. In order to ensure best possible viewing for guests, lighting was an important factor in the overall building requirements. Because light is a crucial factor for reef-building corals and other sea life, Donald Uricchio, head curator of the aquarium exhibit, had a few very specific requirements for choosing the light fixtures for the Gulf Stream Aquarium. First, the lights had to be royal blue in color. 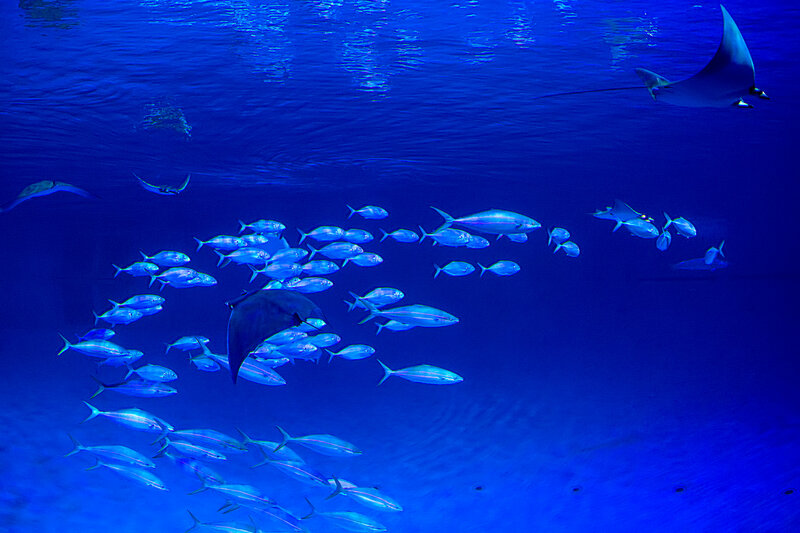 Blue light in aquariums is important for a few reasons. For one, blue light’s high color temperature means that the light penetrates deepest in seawater. Secondly, blue light promotes photosynthesis in coral and sea life environments better than any other color, therefore promoting coral growth and maintaining marine tropical fish health. Third, blue light specifically evokes colorful pigment production in coral, making the environment look both natural and attractive for viewing. The second major requirement was that the fixtures must reduce energy consumption. The old exhibit utilized energy-sucking 2,000W fixtures. Not only were these old fixtures inefficient, but they also caused unwanted heat in some of the habitats. So, replacing the old fixtures with LED was a no-brainer. LED lights cut energy use by more than 70% when compared to HID equivalent. LEDs also have a useful life of more than 25,000 hours, meaning they can last more than 25 times longer than traditional bulbs. LEDs use energy more efficiently than traditional bulbs which release 90% of their energy in heat. LEDs on the contrary emit almost no heat. That means the cooler LED fixtures help recreate the lighting conditions needed by live corals. 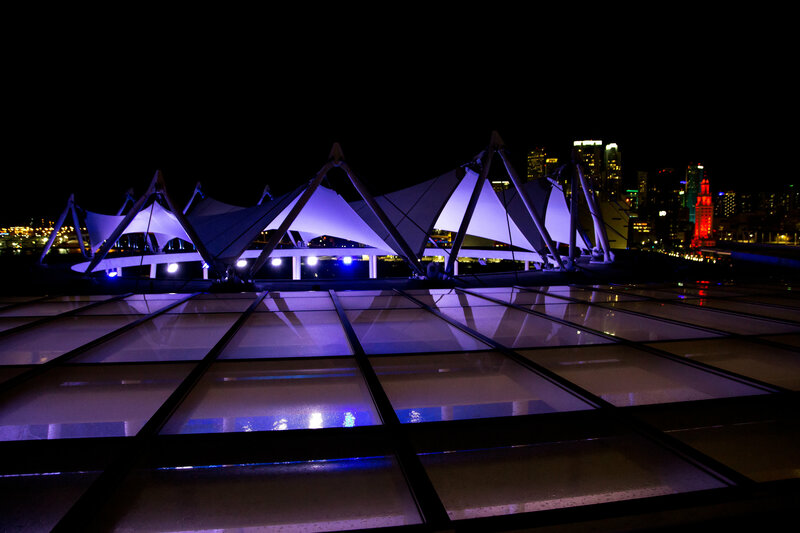 To satisfy the unique requirements for lighting an aquarium, Phoenix Lighting worked carefully with the Frost Center and rep agency SESCO Lighting over the course of about five years to develop a high intensity LED lighting fixture. 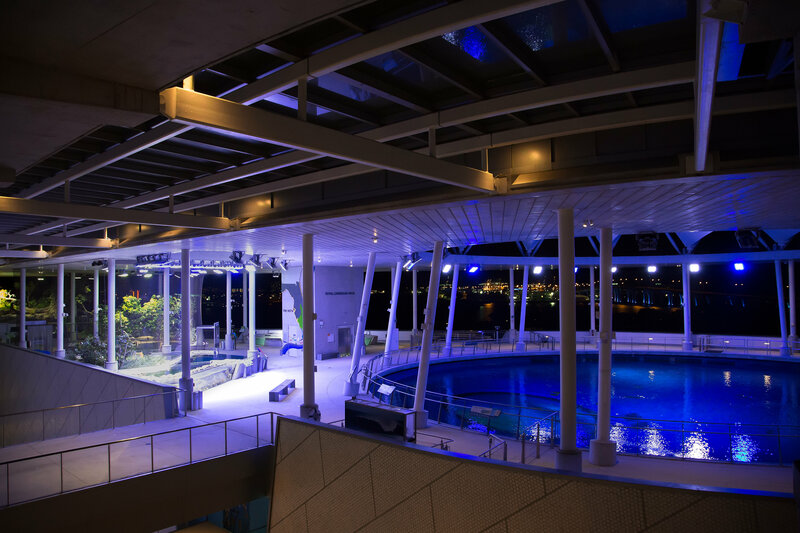 The fixture needed to be customizable for certain specific color temperatures to promote coral growth and maintain marine tropical fish health, and outdoor marine rated with dimmable ballasts and interchangeable optics. The solution? Installing 66 of Phoenix’s EcoMod Series heavy duty marine grade floodlights - with a few modifications. Phoenix’s engineering team changed the LED chip’s color temperature, replaced the old LED driver with a dimmable driver, developed custom optic lenses that could be easily swapped out if needed, and added a unique LED pod system which enabled the replacement of portions of the LED array rather than the whole array. This made for an extremely user-friendly fixture and allows the aquarium to customize one fixture for different displays if needed. Based on Phoenix’ customization of this new fixture, the aquarium can control each fixture using a 0-10V interface and a DMX control system. The EcoMod Series, combined with 450 nanometer blue LEDs, proved to match the needs in lumen output, optical design, and cost. 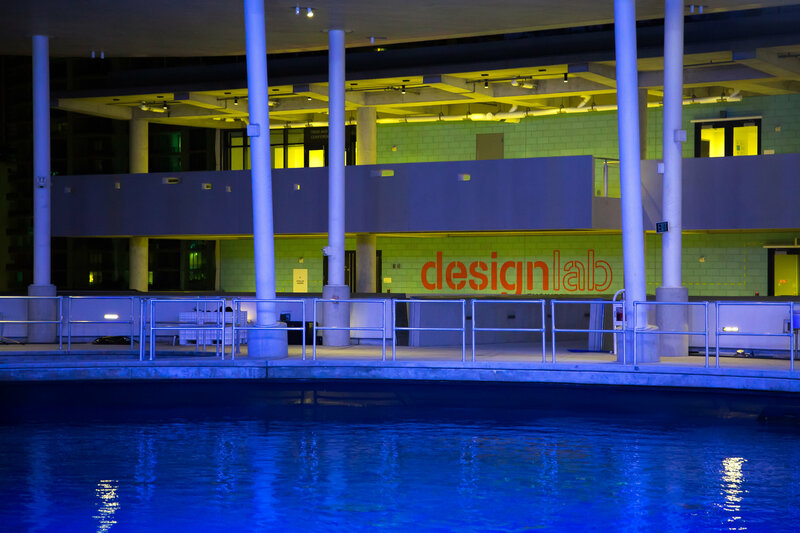 The development of this new fixture opens up new opportunities for public aquariums, zoological facilities, science museums and research facilities to transition to LED lighting for improved energy, efficiency and affordability. The EcoMod 2 LED floodlight features a compact design and improved performance. The next generation of Phoenix' smart, proven fixture was specifically engineered based on industry feedback.